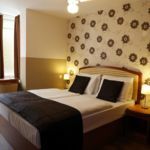 Set in a central location of Budapest, 350 metres from the UNESCO-listed Andrassy Avenue and the Kodály Körönd Metro Stop, Six Inn Hotel offers en-suite rooms and free WiFi access in all areas. The hotel features modern rooms with a flat-screen TV, air conditioning and a minibar. Some units feature a balcony. A 24-hour front desk service is available for guests. Buffet breakfast is served every morning between 07:00-10:00 for a surcharge of 9 EUR / person / occassion, and Six Inn Hotel also features a 24-hour lobby bar. Guests can relax in the inner garden, while a hot tub and an infrared sauna are also at guests' disposal for a surcharge. The Széchenyi Bath as well as the Heroes' Square are a 15-minute walk from the building. The Liszt Ferenc Square with restaurants and pubs is 800 metres away from the Six Inn Hotel. Westend City Centre shopping centre and the Nyugati Train Station can be reached within a 10-minute walk. The rating of Six Inn Hotel Budapest is 9.3 from the maximum of 10, based on 250 real guest reviews. "kedves segítőkész személyzet, tiszta környezet, belső udvarra néző csendes szoba." "Szuper személyzet, kiváló reggeli, minden karnyújtásnyira"
Based on the reviews and comments of actual guests, the services of the Six Inn Hotel Budapest have received a high rating of 9.2/10.